In 1638, New Haven’s Puritan settlers arrived in the harbor, then proceeded to sail up the East Creek before docking near the present day intersection of College and George Streets. 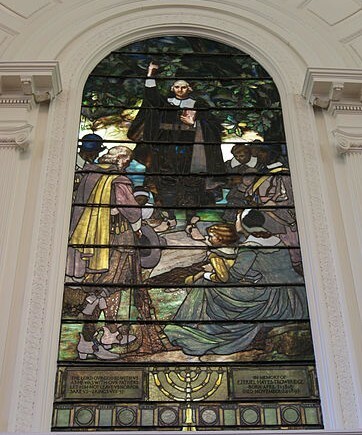 This was also the site of the first sermon by Reverend John Davenport, co-founder of the New Haven Colony, after arriving to Quinnipiack. Soon after the East Creek was filled in 1875, the Oak Street neighborhood grew westward toward the West River – connecting the Upper Hill and Dwight neighborhoods. By the early 20th century, the area was considered a slum by many in the city. When Federal and State funding became available for slum clearance, redevelopment, and highway programs, the City and State jumped at the opportunity to demolish the Oak Street and Legion Avenue neighborhoods with plans to build a highway connector. Those plans, however, never came to fruition and by the turn of the 21st century, all that had been built was a partial highway spur east of York Street, a massive parking garage, surface parking lots, and North Frontage Road, a new surface street leading from State Street to the Boulevard. In 2002, the State transferred the land acquired for the highway connector back to the City for economic development purposes. At the time, the Cecil Group had been working on the City’s Municipal Development Plan for the Route 34 West corridor. In 2011, North Frontage Road was renamed Rev. Dr. Martin Luther King Jr. Blvd, but Route 34 West still lacks a definitive plan for development. By 2015, four major development projects had occurred along the middle part of the corridor, including a Pfizer Pharmaceuticals building, a parking garage with retail space, and two biomedical buildings, with one more development beginning construction between Dwight and Orchard Streets. Between Dwight Street and Sherman Avenue, MLK Blvd exists as a two-lane westbound roadway with wide shoulders carrying an average of 12,400 vehicles per day. The south side of the street lacks sidewalks and is populated with parking lots while the north side is characterized by vacant parcels with odd angles that resulted from the new street having been carved through the neighborhood in the late 20th century. While a sidewalk does exist on the north side of the street, without active uses along the corridor and speeding cars, pedestrians remain rare. Near the intersection of the Boulevard, MLK Blvd transitions from two travel lanes to three 11-foot turn lanes. This portion of the roadway carries an average of 11,800 vehicles per day. With the vacant and underused land along the Route 34 corridor now under the city’s control, an opportunity exists to create a more welcoming, connected, and vibrant place worthy of Dr. Martin Luther King Jr.’s name. An important part of making MLK Blvd a place people will want to go is to create public infrastructure of streets and sidewalks that are pleasant and easily navigable. Some of the following images and recommendations come from the article “A Call for a Hill-to-West River Community Plan” that can be viewed here in greater detail and with a broader context. With MLK Blvd’s 33-foot width, there is room for three 11-foot travel lanes instead of two-travel lanes with wide shoulders. Furthermore, two of those 11-foot lanes can remain westbound towards the Boulevard while one travel lane allows eastbound access along the street. Additional improvements might include cutting into the curb for on-street parking spaces, street tree planters, wide sidewalks and a two-way protected cycle track along the south side of the street. The existing configuration od MLK Boulevard with two westbound travel lanes is designed to handle around 20,000 vehicles today, which is nearly twice the number of cars that actually use the roadway. The proposed two-way layout would still be able to handle 18,000 vehicles in the westbound direction along with an additional 5,000 vehicles in the new eastbound lane. In addition to the improvements outlined above, west of Sherman Avenue on a thin strip of vacant land between MLK Blvd and Parmelee Street, there is an opportunity to provide a parallel local street with perpendicular parking. This would provide additional parking spaces for future commercial and residential construction, remove local traffic from the main roadway, and turn MLK Blvd into a true urban street worthy of the boulevard title. MLK Blvd is a street that traverses an area with a deep connection to the city’s history and is now named for an important figure in American culture worthy of a vibrant place in the city. 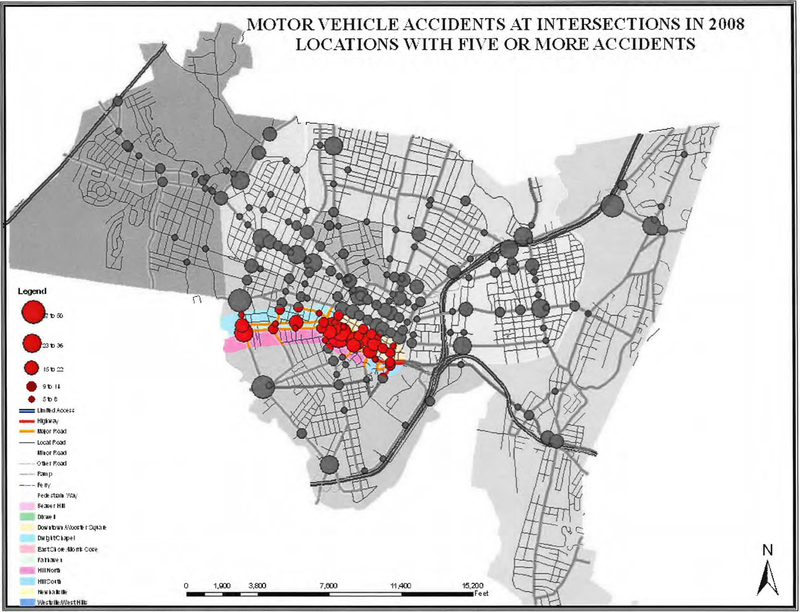 However, the street’s current configuration leads to speeding, large numbers of vehicle accidents, and an environment that people try to avoid. MLK Blvd’s generous width and vacant lots, on the other hand, offers the ability to transform the corridor into a true mulitmodal boulevard in the tradition of the best European urban streets. The city has recently looked at converting many Downtown streets from one-way travel to two-way. MLK Blvd might be another candidate for this type of improvement without losing much of the roads traffic capacity. The city has been working on a West River Mobility Study (see here) that calls for a two-way protected cycle track on the north side of the MLK Blvd. This would be a monumental improvement over the current situation, but is in many ways inferior to a cycle track on the south side of the street. First, vacant parcels east of Sherman Avenue would be larger without the cycle track; second, a local street with parking could be built west of the Sherman Avenue if the cycle track were located on the south side of the street instead; third, there would be less conflict with private property lines and existing sidewalks; and finally, residents of the Hill would have easier access to the facility. It appears, however, that the recent development by CenterPlan negates the idea of a cycle track on the south side of the street – making the city’s proposal the only viable plan at this time. Even so, many of the recommendations outlined in this article would still prove useful in any redevelopment attempt of this vital corridor.